Thirty-four men sat down at the first dinner of the Adventurers’ Club given at Joel’s Restaurant in New York in the year 1912. They were soldiers, sailors, hunters, trappers, travelers, journalists, authors and scientists. Four toasts were offered: "To Adventure, the Shadow of Every Red-Blooded Man;" "To the Game;" "To Every Lost Trail, Lost Cause, and Lost Comrade;" and last "To Gentlemen Adventurers." Thus was the first Adventurers’ Club inaugurated and such are the personnel and spirit of all of the Adventurers’ Clubs. 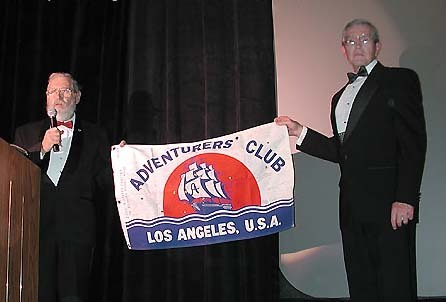 From this original Club have been founded The Adventurers’ Club, Chicago, in 1913; The Adventurers’ Club, Los Angeles, in 1921; The Adventurers’ Club, Copenhagen, in 1937; and The Adventurers’ Club, Honolulu, in 1955. The Club is affiliated with the Savage Club in London, the Travelers Clubs in Oslo and Istanbul, and the Adventurers’ Clubs in Pretoria and Singapore. The Club has always attracted the best and the brightest of the world�s most adventurous spirits. They have been carried to the rough country of Baja California, to the summit of Mount Ararat and the Matterhorn, in the Amazon jungles and over the Humac Mountains into Brazil from French Guiana, to Antarctica and the length of the Mackenzie River to the Artic, rivers of the Nile and Congo, river runs of the Grand Canyon of the Colorado and El Sumidero Canyon of Mexico, to the "Lost World in Venezuela," the jungles of New Guinea, outback in Australia, on small craft to numerous islands of the Pacific, and many other places.